Infovox iVox provides system-wide clear and pleasant voices to Mac OS X for blind and vision impaired users, for individuals who need audible feedback or reading support, for language learning and for people who prefer listening to their computer. Infovox iVox offers over 100 voices in 29 languages. The natural-sounding voices can be used in any Mac OS X application that uses speech, such as Apple’s VoiceOver screen reader, Safari, Adobe’s Acrobat Reader, TextEdit and Preview. This software is also included in Proloquo and VisioVoice and can be purchased together with GhostReader. With the introduction of Infovox iVox 3, you can now purchase individual voices à la carte using "voice credits". After your voice credit purchase is completed, you will be provided a "Voice Credit Activation Code" to redeemed to your Activation Account using a "Redeem Activation Code" function. The voice credits in your Activation Account are then used to acquire individual voices of your choice. All voices require one voice credit per voice per computer. Existing Infovox iVox 2 Customers: Existing Infovox iVox 2 licenses can be used in Infovox iVox 3. When the Infovox iVox 3 Voice Manager starts the first time it will prompt to re-activate installed Infovox iVox 2 voice licenses to a designated Activation Account. Infovox iVox 2 language licenses previously purchased can be activated using the Infovox iVox 3 Activation Manager on up to two (2) computers. 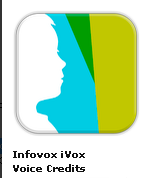 Users that run Mac OS X 10.4 or 10.5 can continue to use Infovox iVox version 3.1.1, but cannot use the new voices. Mac OS X 10.5 or higher is required for Arabic, Czech, Greek, Polish, Russian and Turkish voices.